Once only found in the domain of the marathon racer, these efficient paddles have gained popularity in recent years with recreational paddlers. We didn’t invent this stuff, our hats off to the racers who did. Long hours on the water make every technical advantage a windfall, and we know a good idea when we see one. Our goal has always been to put good ideas into production. In addition to all of the features found in our recreational line, the wooden paddles have a continuous, 8-ply bass wood, form-molded bent shaft. These are excellent shallow or deep water paddles that offer increased efficiency through paddle design and paddling technique. The blade of the paddle is offset from the shaft to allow the blade to remain vertical to the canoe’s path throughout the stroke. This improves the efficiency of each stroke and allows shorter strokes at an increased stroke rate. These factors coupled with a ‘sit & switch’ technique (i.e. changing sides every twelve strokes or so to reduce fatigue and steering correction) make Grey Owl bent shafts hard to beat for long distance paddling. Bent shaft paddles are not designed to be a cruising type of paddle and the angle does limit the types of stroke one can apply thus making it a tricky paddle to use in wind and moving water. Regardless of the model of straight or bent shaft paddle you have selected, the overall length should be determined by the shaft length from the top of the grip to the throat of the paddle. 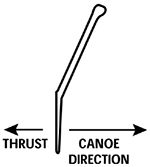 The following formula applies: the shaft length should equal the distance from ones shoulder to the water line of the canoe. This will allow you to paddle below your eyes with your upper hand while keeping your lower hand close to the throat. To determine the approximate length sit erect on a flat hard chair or the floor and measure the distance from the surface to your chin. Add 6” for the approximate distance the canoe seat would be from the waterline. Thus a person whose chin to chair measurement is 26” would add 6” to arrive at a 32” shaft length. Looking at the specifications of our various models you would find that you would probably use a 50” Touring Bent Shaft, a 54” Voyageur or a 56” Chieftain. A one or two inch variation would not have much effect in usage so try for the closest shaft length for the model chosen. Remember to consider that canoe seat heights vary as might a ‘comfort range’ that you might feel more suited to. The only exception to this rule would be our Hammerhead paddle. A completely different technique is used for white water canoeing and you may end up adding approximately 12” to your chin to chair length.